Out of all the annual franchises that arrive in time for the holidays, Skylanders may be one of the most successful out there. It’s still a young series as well, but it’s certainly captured a fair share of the market with the toys-to-life genre. 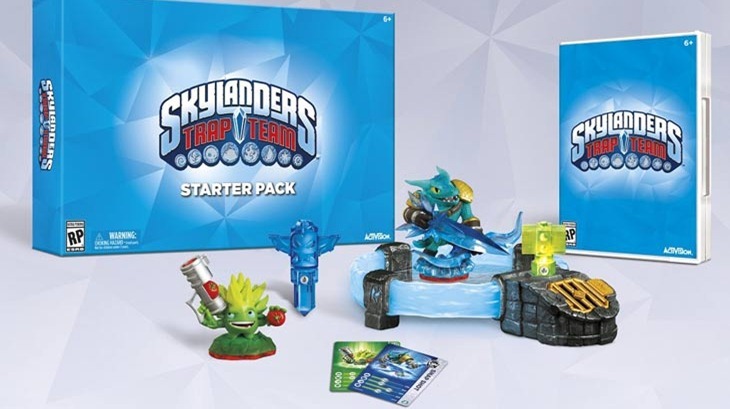 Now heading towards a fourth game in the form of Skylanders: Trap Team, it’ll see that world increase massively once again. So what makes Trap Team the next hot thing, over Swap Force? As far as toys go, Swap Force had a great hook that allowed players to mix and match their characters to create new hybrids. According to the folks behind Trap Team however, the new dynamic of playable villains who can be switched in and out with the heroes instantly, will make this a Skylanders game to remember. “We’re taking the Toys to Life category to heights that we’ve never seen before. We’re reversing the magic of bringing toys to life, by allowing portal masters everywhere to bring life to toys. So how we’re doing that, is with the introduction of a new toy type called Trap, and a Trap is made of this magical material called Traptanium”, executive producer Scott Kraiger explained. And what this allows players to do, is to capture the most wanted villains of Skylands, and bring them out of the game and into the living room, via these traps and portal of power. So imagine fighting through all the crazy areas of a level, come across a most wanted villain, defeat them and then you actually place one of these Traptanium traps into the portal, pull them out of the game and now they’re stored in this trap. You can now take that trapped villain, put it in the portal and bring that villain back into the game and have him be a fully playable character who fights for good. So you can now play as the Skylanders, or play as these captured villains who you’ve turned to good, so that’s a whole new layer to the Skylanders experience. Speaking of villains, there’ll be plenty of them to battle in the game, and trap. Fortunately for parents, they won’t have to buy a crystal for each bad guy encountered, and will need only one crystal trap per element. “We’re going to have over 40 villains to capture, each one will have their own personality, have their own powers”, Kraiger explained. So you’ll encounter them in the game, and you’ll get a sense as you defeat them the first time of all the cool things that they can do although they’re doing them against you, but it’s going to set these expectations for players and obviously this desire that you will want to capture them so that you can then turn them into these playable characters that you can use and take advantage of to fight for good. And one thing that we’re introducing that’s new, is what we’re calling the tag team feature. 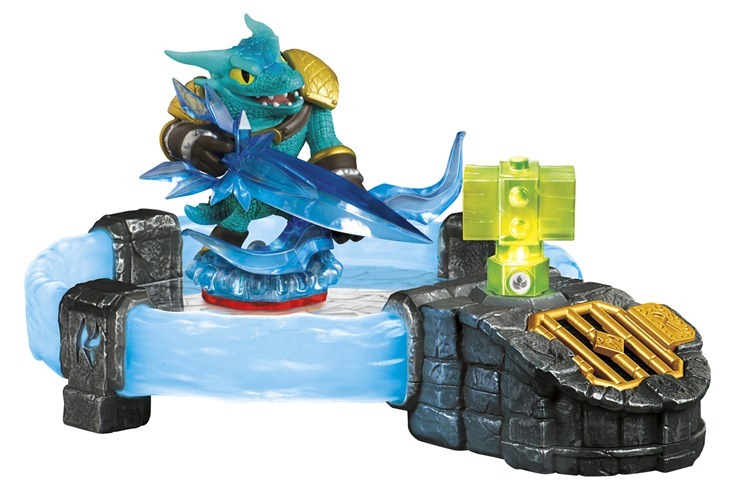 So basically you have a Skylander on the portal, and you have a crystal trap on the portal with a trapped villain inside, you can immediately switch with one button press between playing as a Skylander and playing as a villain and you can combine powers. Depending on the combat situation, it’s going to have this really cool layer added to the game. 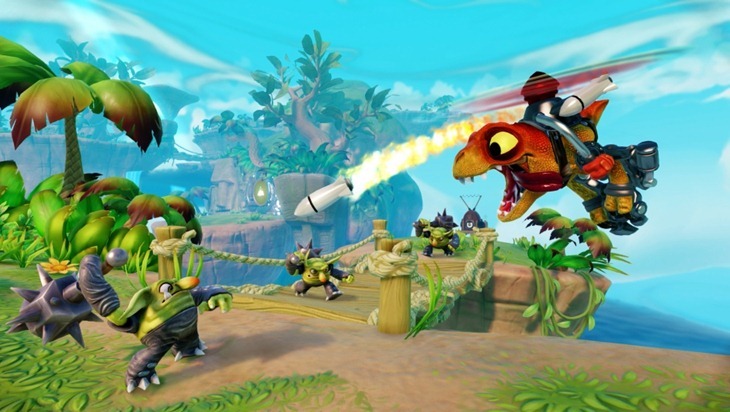 A ton of new Skylanders, and plenty of villains are going to be the hallmarks of this latest version of the game. That opens up a lot of potential in the gameplay department, and according to Kraiger, it’s been a challenging task to keep a sense of balance in the game, while shining the spotlight on the characters that deserve it. 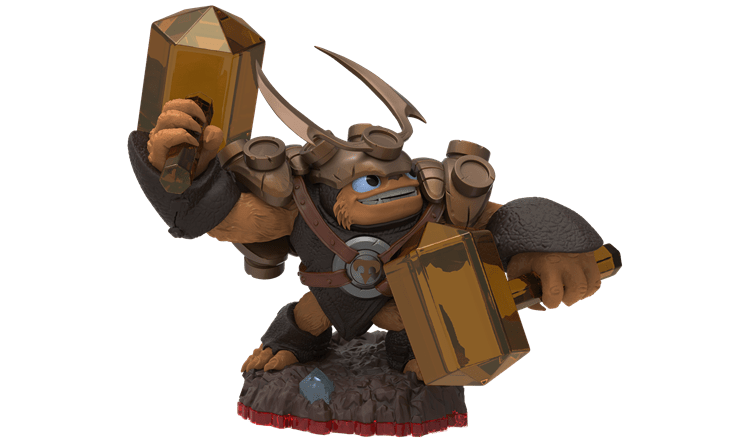 “There’s a lot of work inherently that goes into something as innovative as this, so we really did spend a lot of time deciding how best to balance playing as a villain and playing as a Skylander” Kraiger explained. Because the Skylanders are the heroes of the franchise, and it certainly makes sense to not take away that they’re the superheroes, but at the same time we need to make sure that the villains are interesting, fun and have a functional use for the players that want to use them. So I think one of the more challenging things we had, in terms of prototyping and iterating, is to find that perfect balance. How can we make the Skylanders and the villains equally fun, but not have both take away from each other. So it’s still a lot of time iterating on that and getting kids into the playtest sessions to gauge their reactions on the different powers and tag team ideas. 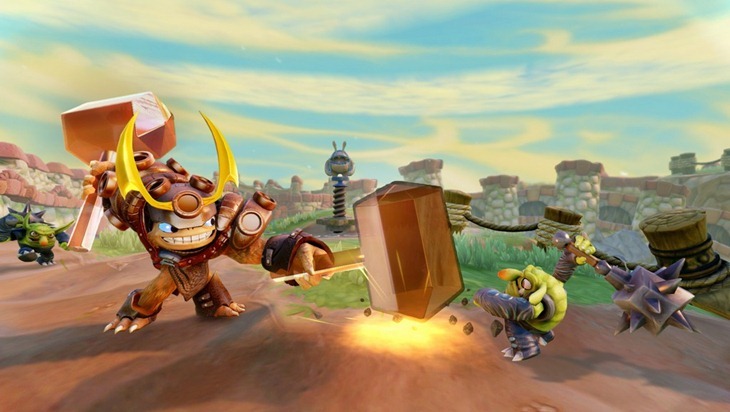 The key aspect of Skylanders however isn’t the collectable side of the game, or the adventure itself. It’s that Skylanders is and always will be a game that is tailored for families. And that’s something that Kraiger wanted to emphasise when the topic was brought up. “First and foremost, even from the first game Spyro’s Adventure we’ve thought of Skylanders as a game for kids and for families” Kraiger said. So the type of environment, the type of heroes, the type of characters and everything about the game is about creating this magical fun adventure for kids, primarily kids six to twelve, but also kids of all ages.We really do target the families. Another year of Skylanders, another evolution of the design. Ever since Spyro’s adventure debuted, developers Toys for Bob and Vicarious Visions have tweaked the style and attitude of the numerous characters that they’ve created. And Trap Team will be no different. “Every year we really challenge ourselves to create new characters that exceed the previous games,” Kraiger explained about the design process. hen we added 16 new character in Giants and then 32 new characters in Swap Force and you’re looking at this massive library of characters and thinking ‘how are we going to make new characters that feel unique, have new designs, have personalities that we haven’t seen before’. But really, the team, the developers at Toys for Bob has really done an amazing job creating a whole new set of characters. Trap Masters, new characters with unique shapes and personalities and weapons and really it’s the complete package. And it’s one of those things where the talent of the character design and the artists and everyone who puts effort into making these characters, they’ve done a great job. 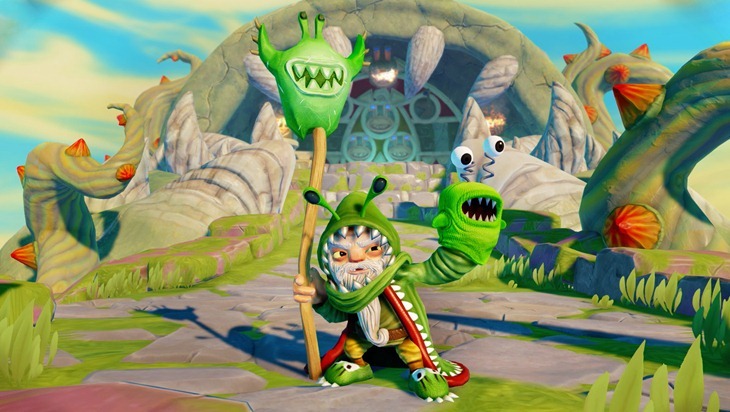 So last year with Skylanders Swap Force, we really set the bar visually, and part of that was being able to take advantage of the horsepower of the PlayStation 4 and Xbox One. 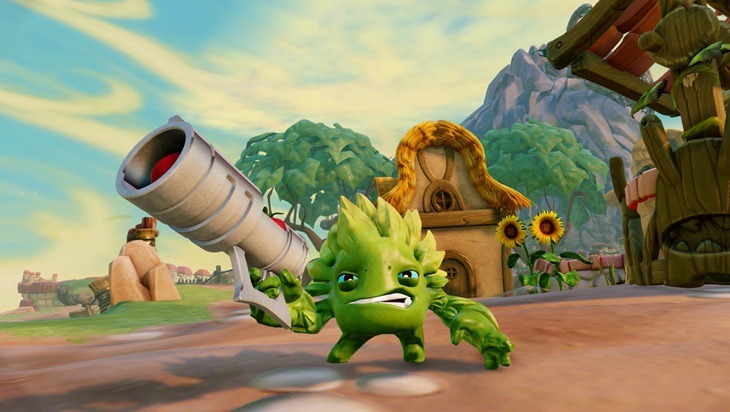 So we’re carrying that forward with Skylanders Trap Team as well, so that really extreme visual fidelity that brought a lot of life and detail into Swap Force, we’re really pushing that graphical edge with Trap Team. You can have a ton of characters in a game, collect a bunch of them and try ‘em out. But you can only have one favourite out of all of them. And Kraiger knows who his favourite Trap Master is. It’s a big guy with even bigger hammers, that goes by the name of Wallop. “I’d say right now my favourite is Wallop,” Kraiger gleefully admitted. He’s got two giant hammers, he’s got this great personality. He’s just this fun-loving, big powerful hero that loves what he does. And when you see him, he might have a smile on his face and he has these two giant hammers that he knows how to wield and he’s so much fun to play as. 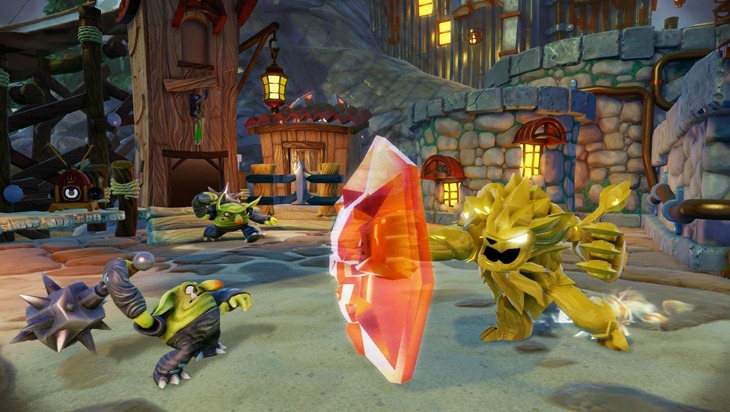 Skylanders Trap Team is out October 5, on current and new-gen consoles.